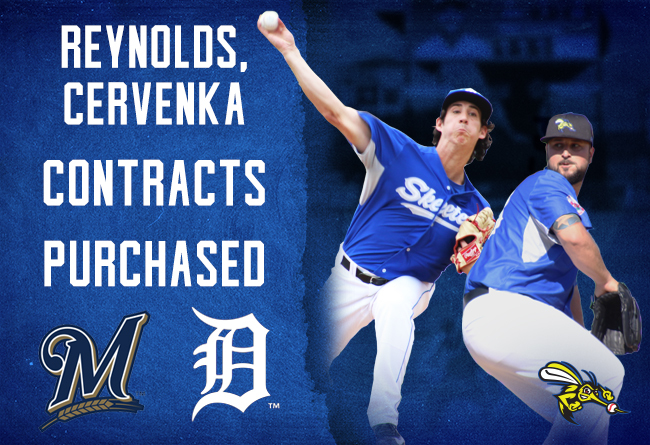 SUGAR LAND, TX— The Skeeters today announced that the contract of left-hander Hunter Cervenka was purchased by the Detroit Tigers and the contract of right-hander Danny Reynolds was purchased by the Milwaukee Brewers. Reynolds reported to Double-A Biloxi and Cervenka is expected to report to extended Spring Training before receiving his assignment. With the purchasing of Cervrenka’s and Reynolds’ contract, seven players from the 2018 Skeeters roster have had their contracts purchased by Major League organizations. Cervenka and Reynolds join right-hander Logan Bawcom (Los Angeles Dodgers), right-hander Alejandro Chacin (Cincinnati Reds), infielder Rey Navarro (New York Yankees), left-hander Paco Rodriguez (Minnesota Twins) and right-hander Mitch Talbot (Cleveland Indians). The seven contracts purchased are two shy of the Skeeters franchise record. Nine players had their contracts purchased by Major League organizations during the 2013 season. The Skeeters had six players have their contracts purchased by Major League organizations over the last three years combined. Cervenka, 28, was leading the Atlantic League with 19 appearances at the time of his contract being purchased. He was 3-1 with a 1.52 ERA in those 19 appearances and struck out 21 batters to two walks while allowing just nine hits in 17 2/3 innings pitched. The Baytown, Texas native first joined the Skeeters in June 2015 and became the fifth player in Skeeters history to reach the Major Leagues after playing in Sugar Land, making his Major League debut in April 2016 with the Atlanta Braves. The other four are left-handers Scott Kazmir and Jason Lane, outfielder Ryan Langerhans and right-hander Tim Stauffer. Cervenka owns a 0.82 ERA in 27 career games with the Skeeters, spanning 25 2/3 innings pitched. Cervenka was selected by the Boston Red Sox in the 28th round of the 2008 MLB Draft out of Ross S. Sterling High School (Baytown, Texas). Along with the Braves, Cervenka has appeared in the Majors with the Miami Marlins (2016-17) and is 1-0 with a 4.69 ERA in 73 Major League appearances (48 innings pitched). He’s played at the Minor League level with the Red Sox, Braves, Marlins and Chicago Cubs, including being selected to the Southern League All-Star Game in 2014 with Double-A Tennessee (CHC). He’s 22-29 with a 4.55 ERA in 252 career Minor League appearances (23 starts). Reynolds, 27, made 11 appearances with the Skeeters this season, spanning 15 innings of work, and went 2-0 with a 0.00 ERA. He led Atlantic League relievers with 21 strikeouts at the time his contract was purchased and was the only pitcher in the league to have not allowed a run with at least 15 innings pitched. He had also allowed just two hits in his last six innings pitched. The Las Vegas, Nevada native last appeared at the affiliated level in 2017 with Triple-A Gwinnett (Atlanta Braves). Reynolds was originally selected by the Los Angeles Angels of Anaheim in the sixth round of the 2009 MLB Draft out of Durango High School (Las Vegas, Nev.) and has appeared at the Minor League level with the Angels (2010-15) and Braves (2017), peaking at Triple-A. He was selected as a Texas League Mid-Season All-Star in 2014 with Double-A Arkansas. In 215 Minor League appearances (42 starts), Reynolds has gone 24-49 with a 4.31 ERA (465 1/3 IP) and has collected 24 saves. Individual tickets are available now at SugarLandSkeeters.com, our mobile app, and at the TDECU Ticket Office at Constellation Field. The Skeeters begin a seven-game homestand against the Road Warriors starting Monday, June 11, at Constellation Field. Enjoy our weekly promotions at Constellation Field, including Margarita and Dollar Dog Monday, Two For Tuesday, Kids In Free Wednesday, Thirsty Thursday and Friday Fireworks. The first 2,000 fans in attendance on Saturday, June 16, will receive a Replica Constellation Field Giveaway. For more information, call 281-240-4487. Visit SugarLandSkeeters.com and follow us on Facebook, Instagram and Twitter (@SL_Skeeters) for all the latest news on the team. Also, Download the official Sugar Land Skeeters app to keep up with the team all year long with news, score updates, stats and more. The free app is available in both the App Store and Google Play.